Cheers Mike, I'd not seen that. See you could interpret it as laziness or that 2015 was a complete fluke which they're now too scared to touch. I don't really think it's either but he is basically saying they're not confident that they can test their game properly. I am loving the game still. It has it's flaws, a lot of them, but nothing you'd call a game breaker. The game has been out 4 months though, so that's possibly 5 months they've had with the release code. Surely someone at least looked at tightening up the cursor changes or something in that time. they have toned down the scripting loads. iy syill exists thiough unfortunetley. however like i said its been toned down and i am loving the game more than ever now. i play 2 bar with manual pass modifier used alot. Sounds like they are working on balancing it out a bit. Glad you're enjoying more now. I still notice it a lot just playing against the Com in the UCL Comps. When I know things are going against me, I'll use the Manual Modifier a lot just to make simple passes as I know the CPU will send the pass to a player who I am not aiming for. Also when the scripting kicks in, I find the CPU can get penalties very easily by going on a "Jinking" run into the box and waiting for a "double X" challenge, just to move out the way of it and get bought down. I now just try and tackle with out pressing a button or just hope they miss when they shoot. To me, if they want to continue with these momentum shifts then they need to find a better, more balanced way of implementing it in. I don't know why they don't just purely use the "heart" feature that is in the game already. In real football there is that moment in games when one team has "the bit by the teeth" for a 5 minute spell and the other team is powerless to stop it. I don't mind that being in PES but it should be triggered by events on the pitch rather then when the game decides to put it in. Basically, just make better use of the "heart" feature. What are your thoughts? They could just create an "arcade" divisions mode where totally everything is equal. i think momentum is just like hand balls really, no need for it in the game. i hope its completly gone in 2016.
i will try using manual pass when things going against me. i have also stopped pressuring as that leads to never winning ball back and losing shape. jockeying is best in these situations. With Live Updates, OVRs are only boosted for one week at a time. Of course, if a player performs well for consecutive matchdays, his 'boosted stats' will most likely remain. 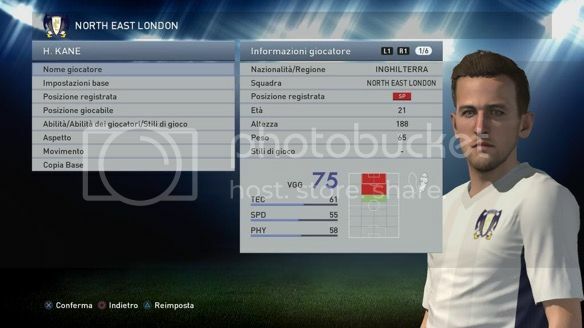 However, a player's base OVR (Kane, 69 SS) will return as soon as they're no longer 'in form'. As far as I'm aware, the only way a player's base OVR can be permanently adjusted is by Data Packs. Speaking of which, I would be very surprised if Kane's OVR isn't boosted by tomorrow's DP4. Shales wrote: I find the CPU can get penalties very easily by going on a "Jinking" run into the box and waiting for a "double X" challenge, just to move out the way of it and get bought down. I now just try and tackle with out pressing a button or just hope they miss when they shoot. When you get those CPU teams that refuse to cross, I can almost never tackle them without fouling. I end up just lunging in regardless before they reach the box...they usually quickly sidestep the tackle and pass to the striker who shoots just inside the far post. The only reasonable success I have is by almost letting them cut in and then trying to tackle them from a right angle. anyone got the new DP yet? is kane improved? Not seen it first hand but I've seen on Twitter that peeps are not happy that he's a 75. Not sure if that's an improvement or not. KONAMI really need to change something (or exchange someone) to get their player stats right. more realism, less FIFA!!! 75 is a slight improvement but consider the consistent season he is having its further proof that konami dont understand the game sometimes!!!!! I take it at this point there won't be any patches to the actual gameplay? I enjoy the game a great deal, but it's crazy to me that they still can't figure something out with the fouls. Also, I'd love to see the deft touch dribble smoothed out a bit, and a little faster response time on some of the skill moves would allow for more creativity and spontaneity. There are also too many unworthy goals conceded in my opinion. Not sure if the GKs are a bit too slow or if the shooting is a bit too overpowered, but I just feel like it's too easy to score in the box with low shots, and finesse shots are almost automatic unless deflected. So glad Konami adding more stadiums it was like having a new game yesterday. Konami got to have at least 40 stadiums on the game it's such a breath of fresh air. Adds to the realism of the game even if some are generic. I'm guessing the new grounds are going to be PS4 XBone only again? itstroff wrote: I'm guessing the new grounds are going to be PS4 XBone only again? Correct. Real shame as I am sure the old gen market is still the games biggest market.